Kalooki (Jamaican Rummy) or Kaluki, is a version of Contract Rummy which is very popular in Jamaica. A version called "Super Kalooki" is played in tournaments while a version called "Baby Kalooki" is often played with children or for purposes of teaching the game. There are a few variations of the game described in books and on the internet. This article gives the basic accepted tournament rules and some popular home variations. 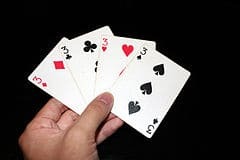 Note that there is another popular game also called "Kalooki", sometimes referred to as "Kalooki 40"
A "3" is a set of three or more cards of the same rank, such as 5-5-5 or K-K-K-K-K. The suits of the cards do not matter and duplicates are allowed. A "4" is a run of four or more consecutive cards in the same suit, such as spade7-spade8-spade9-spade10-spadeJ. Aces can be high or low, regardless of their point value, but they cannot be in the middle of a run, so A-2-3-4 and J-Q-K-A are valid, but Q-K-A-2-3 is not. When more than one "4" is put down by one player, they must be of different suits, and when more than one "3" is put down by one player, they must be of different ranks. In games where three sets of "4" are required a full suit can be used to substitute. In a "4" jokers cannot be used for consecutive cards - so club9-Joker-clubJ-Joker is OK but club9-Joker-Joker-clubQ is not. In a "3" there must be at least two genuine (non-joker) cards, so 4-4-Joker and 7-7-Joker-Joker are OK, but 9-Joker-Joker is not. Jokers cannot be removed from their set. However, when a joker is used in a "4" it can be moved up, in that set, by the holder of the real card that it represents (see tacking below), provided that two jokers do not end up side by side. Once a joker moves as far up in a set as it can go it can no longer move. A player may not add jokers to sets laid by other players. They may only place jokers on their own sets. Once a player plucks from the stock the previously discarded card is "dead" and cannot be called. Each player is allowed a maximum of three calls per hand (deal). Since each call adds two cards to a player's hand, you can check how many calls you have made by counting the cards in your hand. The first cards you lay down must satisfy the contract for the game being played. There is no point requirement as in some other versions of Rummy. You place these cards face up in front of you, where they stay for the rest of the hand. If there are other sets on the table you may tack on cards as appropriate (see tacking below) and then discard as usual. After laying down the contracted sets, you are allowed to lay down additional appropriate cards to any of the sets laid on the table, in the same turn, or in later turns of the same hand. This is called tacking on or laying off. Further cards of the same rank can be tacked onto a "3". A "4" can be extended by tacking on the next higher or lower card in sequence. When the suit is complete no further tacking is possible. Jokers can only be tacked on a player's own laid sets. As soon as a player goes out by getting rid of all their cards, the hand ends. The other players count the total value of the cards they have in their hands (see above) and add the result to their cumulative point total.